The city of Belfast is every bit charming as lazy. The rustic architecture from the Victorian era makes it seem like a time travel. 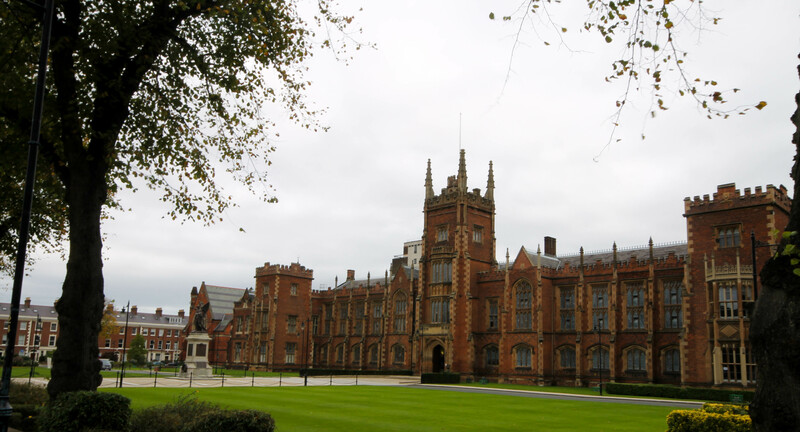 My first stop for the day was the Queen’s University, one of the finest architectural sites of Belfast. The city was preparing itself for the annual festival as I walked past. It would have been nice if I had made it here during the festival. The university quarter has the best eateries and pubs of Belfast, I am told. Walking past the charming buildings I arrived at the Ulster Museum. Ulster is one common word that you would notice while in Northern Ireland. It is the word that refers to the Ulaidh, or the ancient region that was ruled by tribal Irish people long ago. 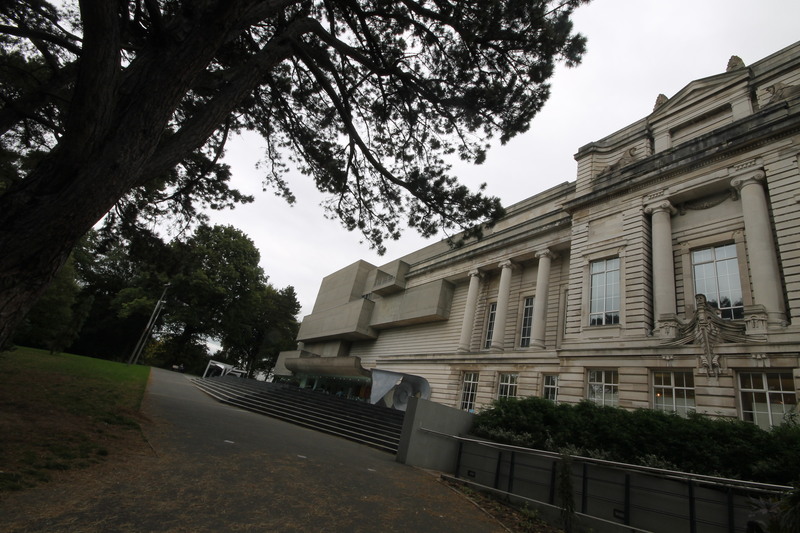 The Ulster museum attracts you at the entrance itself. The facade of this building is done in what they call brutalist style of architecture. It has an awesome and stark contrast with the classical 1929 and modern art which gives the perfect blend of what kind of exhibits to expect inside. The museum has mummies, dinosaurs and a lot of history but also art exhibitions from the yester year great to new kids from across the wall university quarter. I took a stroll in the garden and then walked through the restaurant area for a quick fired lunch, the Irish favourite. The cramped journey from last night was taking on me, and I decided to take a short nap than spoiling the evening walk. The fried potato and mash from Maggi’s made it easier for me as I slipped into the green blankets of Youth hostel. The free walking tour started at 4 with two couples and me in the group. The guide was an Irish man from Derry and had a lot, infact lot to talk about Northern Ireland and its Troubles. The guide had many stories of violence and chivalry to tell as we walked past the university quarter and troubled areas of Belfast. This is probably one country that will have the highest churches per square kilometre. The catholic churches, protestant, Adventist and everyone has their own chapels and worship centres built on every street. The country is very unique with its spread of Christian castes, more unique that it has created a never ending civil war in the Northern Ireland that cost thousands of lives. The Troubles, as they were called, triggered a series of violence from 1960’s. Unionists and loyalists, who mostly come from the Protestant community, generally want Northern Ireland to remain within the United Kingdom. Irish nationalists and republicans, who mostly come from the Catholic community, generally want it to leave the United Kingdom and join a united Ireland. The former generally see themselves as British and the latter generally see themselves as Irish. Imagine a country with its police man and their family having to live in fear of being killed anytime!! A government who gives its cops a mirror reflector to check underneath their car for any bombs before they get on it! Northern Ireland has gone through a long political unrest since decades now and they hope to have ended it with the Good Friday agreement of 1998. Even today there stands a peace wall between the area that homes the catholic and the protestant. The gates between the two remain closed over the weekend to prevent any sort of violence. The city sort of became lively towards the evening and there were much more people as we walked past some of the narrow, cobbled streets of Belfast. The Guinness tasted better at a local pub with some traditional singing and the guide left us for the night. After few mugs, I walked towards the last point on the day’s itinerary, the Titanic Belfast. 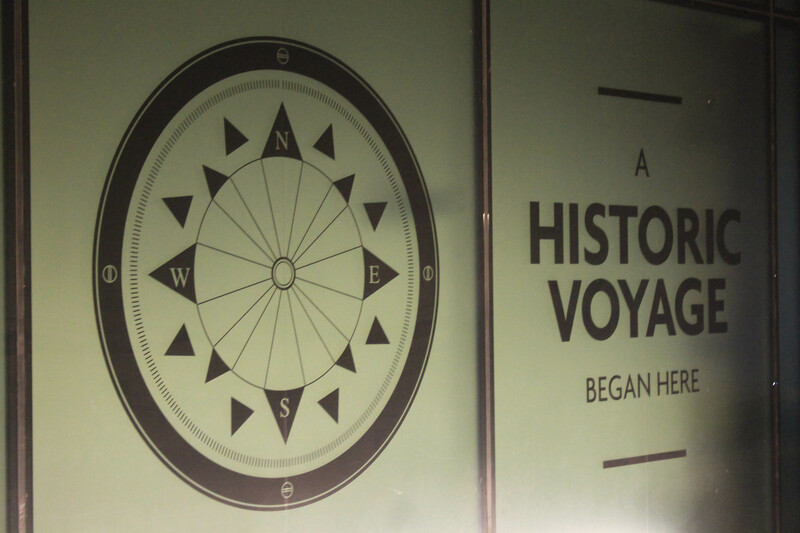 It was here in this city, the most famous ships of all time set sail on its first and unfortunately last voyage. 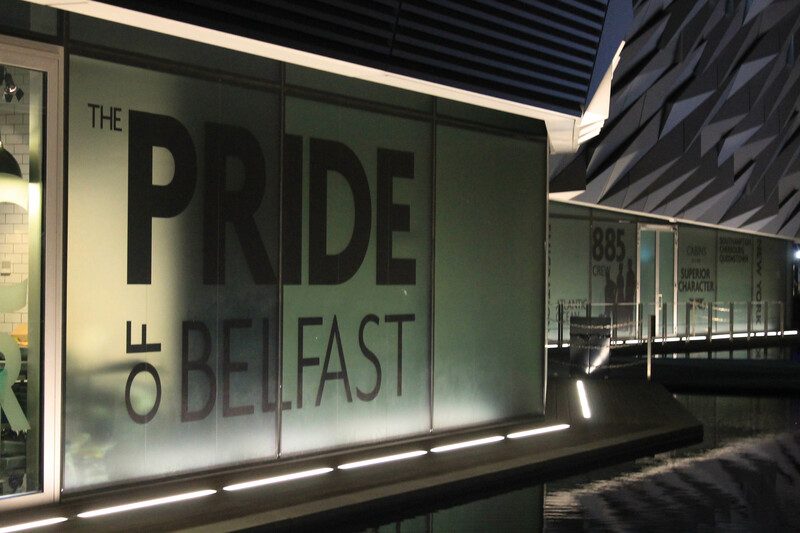 The fact that it was built by the Belfast based White line company employing Belfast’s very own island men made Titanic the pride of Belfast. The actual fact is that Titanic isn’t the only ship that sunk around this area, right from the early 14th century, when sea warfare was common among European countries, the North Sea and the Irish Channel have swallowed a number of vessels and ships around Ireland including the legendary Spanish Armada. But it was the Titanic that sank in the Atlantic on its way to New York went on to became immortal, thanks to the immaculate storytelling of James Cameroon. 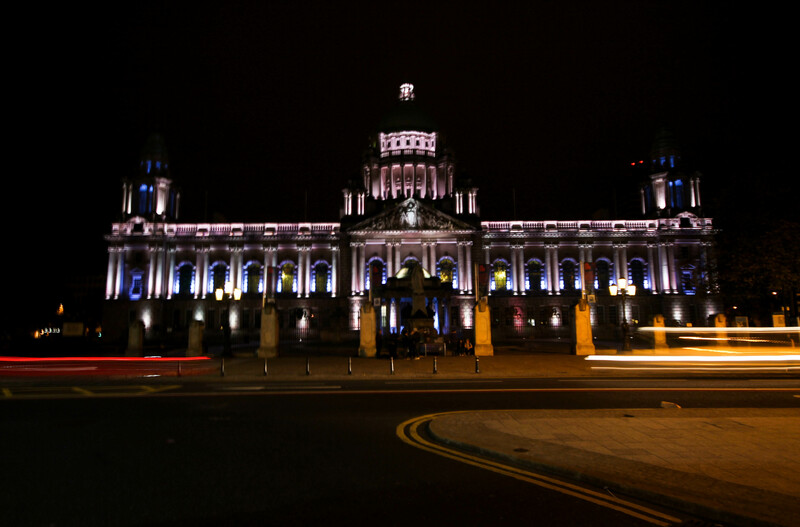 There is a Titanic memorial built near the townhall to honour especially the sailor men who were mostly from Belfast. The guide that took me on the walking tour wasn’t so impressed with the Titanic exhibition in the city but the Titanic memorial built further outside, closer to the two gigantic cranes, Samson & Goliath, that built the Titanic, is an impressive structure, especially in the light. It is a hard task to imagine how the early 19th century Belfast looked during the hay day of ship building. It is very interesting to co-relate scenes from the movie standing on these very banks. If not anything, at least imagining how a common man would have amused and looked at the Titanic, with popping eyes and dropped jaws, waving at the ones that were sailing and at whom they envied until they heard the tragic news!